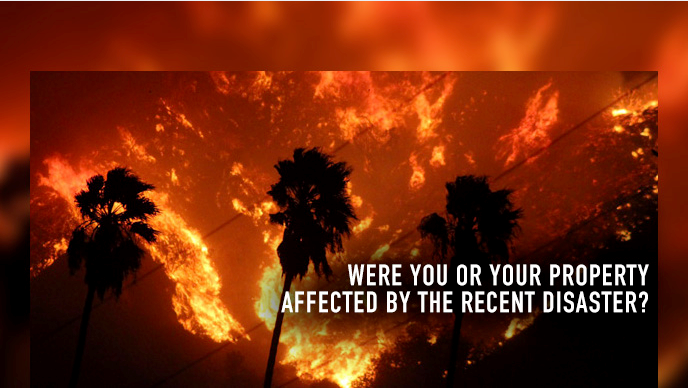 The Ventura County Treasurer-Tax Collector’s Office is aware that many residents of Ventura County have been affected by the fires that began November 8th, 2018. If you have recently sustained a property loss, you may qualify for property tax relief. Please visit the Ventura County Assessor’s website (or click here) for information on filing a Calamity Claim. We advise all taxpayers that are able to pay their taxes, the due date is still December 10th, postmark accepted. At this time there is no general extension of the December 10th due date. If you missed the Secured property tax 1st installment due date of December 10th because you were a first responder, or your property was damaged, or because you were evacuated from the fire zones, please fill out the Cancellation of Penalty form below, for review by the Tax Collector. Documented verification is required to substantiate your claim.